Have you ever started a compost pile (if not, CLICK HERE) with the intentions of hot composting and just not had enough materials? We have mainly pine trees in our yard supplying us with a lifetime of pine needles, which don’t break down so quickly. 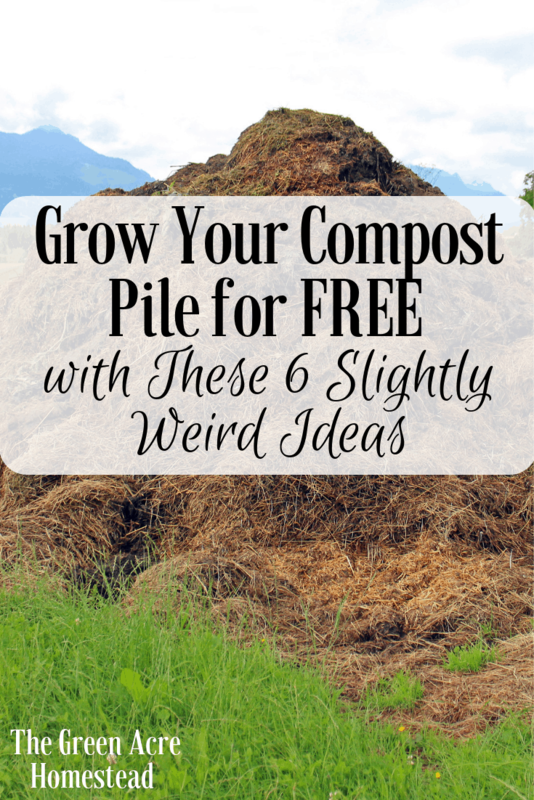 I’m constantly thinking of ways I could acquire more materials and grow compost pile for free. Here’s what I came up with! Would try any of these? We have SO MANY BARBER SHOPS in Homosassa, Y’all. People must be really serious about getting their hairs cut. Well, I was thinking the other day how easy it would be to go to a local barber and ask for the hair clippings they sweep up off the floor! Talk about free compost pile material! Of course, you’d have to be sure to get untreated hair since hair that’s been dyed. Dyed hair has chemical in it and might not be the best organic option for your pile, even though it would still break down. Would you do this where you’re from? Okay, don’t actually take food from your friends because that’s not cool. What I mean is ask your friends to save their compostable scraps for you! My mother-in-law saves all her compostable scraps for me in a food grade bucket with a Gamma Seal screw lid. Once the bucket is full, she gives me a call or drops it off and into the compost pile they go! I bet you’ve heard about folks getting leftovers for their pigs from local restaurants, right? Well, why not ask your local restaurants for their kitchen scraps? If they’re not already supporting a local farmer by donating those scraps for an animal, you should ask to have them for free to compost them! Think about the number of lettuce butts, carrot tops, and eggshells that are just thrown in the trash at restaurants. All of those things are prime composting materials. You might want to present a contract to them saying they aren’t liable for anything that happens with the scraps after they leave the restaurant, just so they feel a little “safer”. If you know the folks, then it should be easy breezy! Think about all the eggshells at your local diner, Y’all! You could always provide them with a food-safe bucket with a Gamma Seal screw lid to keep things sanitary. Okay, okay, don’t actually go around stealing leaves from peoples’ yards now. Come on. But seriously, if you live in an area like mine then there are leaves EVERYWHERE. Except for in my yard, because it seems I got all the pine trees on the block. *Sigh*. Most of my neighbors have fenced in yards and when the wind blows it sweeps piles of leaves against the fences. It dawned on me the other day that those piles of leaves are readily available for my compost pile! I don’t see any problem with kindly knocking on your neighbor’s door and asking to bag the leaves to compost them. Not only are you getting free carbon materials to grow your compost pile, but your neighbor is also getting a free yard cleanup! Win-win! Have you ever noticed that some Starbucks will have little bins that they put large bags of coffee grounds in? That’s because people go pick them up for free and use them in their compost pile and gardens! Pretty cool, huh? Coffee grounds are one of the best materials to add to your compost pile because they’re a great source of nitrogen. If I had to take a guess, I bet your local coffee shops might do this exact thing for you! You could even provide them with a custom colored 5-gallon Gamma Seal screw lid bucket, too, so they didn’t have to worry about smell or appearance! If you want to know how you can recycle your coffee grounds, check out this article by the Imperfectly Happy Home! So we just thought about knock, knock, knocking on your neighbors’ door to ask for their leaves, what about asking for other woody materials? If you live in a small town, your local landscaping businesses might save grass clippings or wood chips for you for free! You could always set up an appointment with them to meet at the location of service that day to immediately pick up the materials to keep it simple. I do suggest asking first if the materials you’re picking up have been treated, though. Just like the hair at the barber, you don’t want to add chemically treated grass clippings and leaves to your organic compost pile. You are what you eat, right? Free or not, we must protect the compost pile. You could ask your friends for their hairbrush hair or nail clippings. YEP, you can compost nail clippings. You can also compost dryer lint (I do!) so you could ask your friends for that, too. There are so many things you can compost, even non-bleached menstrual products! This one might be crossing a line, though, if you were to ask for that from your friends…so choose wisely. What’s the weirdest thing you’ve composted? Previous Post: « Simple Homestead Blog Hop #203!